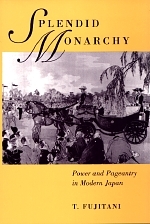 Using ceremonials such as imperial weddings and funerals as models, T. Fujitani illustrates what visual symbols and rituals reveal about monarchy, nationalism, city planning, discipline, gender, memory, and modernity. Focusing on the Meiji Period (1868-1912), Fujitani brings recent methods of cultural history to a study of modern Japanese nationalism for the first time. T. Fujitani is Associate Professor of History at the University of California, San Diego.